Here at Flavours Catering + Events, we offer canapés catering & finger food catering that reflects cuisines from all around the world. Our wide range of options including Aussie nibbles, Asian-inspired items and classic European flavours – just to name a few! These canapé items can be delivered to your desired location in Sydney ready to eat at the time of your choosing. Talk to our event managers today about creating a menu that will truly impress! 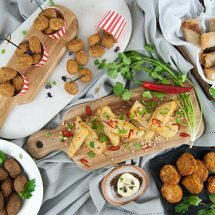 Our menu includes loads of vegetarian, gluten-free and dairy-free finger food items that are as great-tasting and great-looking as our regular finger food items. Just let our event planners know how many of your guests have these dietary issues, and we’ll make sure that we customise a menu to suit. At Flavours Catering, we have a wide array of canapés and finger foods that are sure to delight your guests. 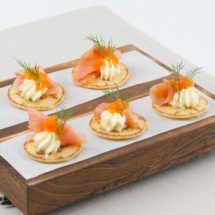 We have fantastic canapé menu items suitable for a casual gathering with friends or a formal corporate event. 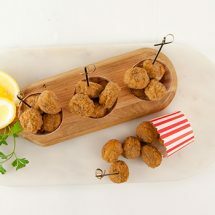 Whether you want to provide a light snack for your guests or a substantial meal of canapé items, we can give you exactly what you’re looking for. Our friendly event planners will collaborate with you to create a custom menu for your party or event. We understand that everyone’s taste and style varies, so we have designed our menus to match. 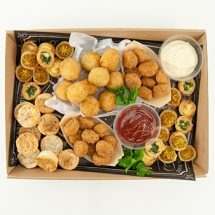 Our finger food catering packages are only a starting point for creating the ultimate finger food menu. Talk to us today about creating a custom menu that will impress even your toughest critics. Planning your next event but not sure what to serve, or where to start? 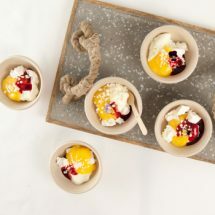 Flavours Catering can help with all of your event needs including providing an expertly planned canapé style menu, beverages to match, staffing and equipment. All you will need to do is tell us where and when!